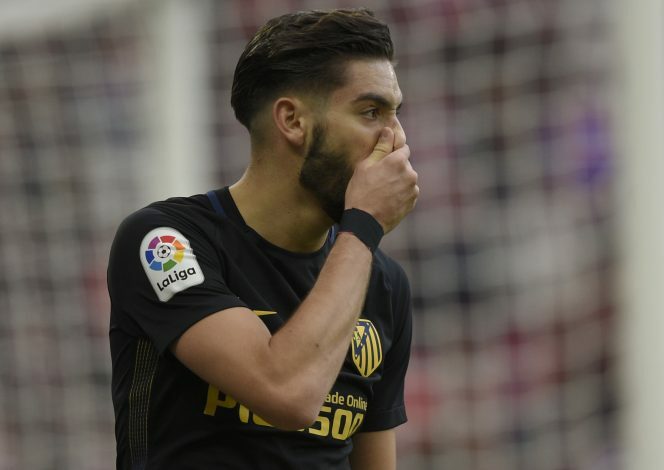 Manchester United are on high alert over the potential availability of Yannick Carrasco, Spanish media reports. The Belgian attacker has been consistently delivering, and has become one of Atletico Madrid’s champion performer this season, after having recently signed a new contract until 2022. But Don Balon suggests a heated altercation after being substituted at the weekend was the latest incident in a long line of spats with manager Diego Simeone, and their relationship has now deteriorated at an extreme level. The Atletico star didn’t even hide his frustration at being replaced by Fernando Torres after 62 minutes during their 0-0 draw at Alaves. Carrasco may become a costly signing as his new deal has a buy-out clause of £90 million. But that doesn’t mean Manchester United will scare away, while Chelsea are also closely monitoring the situation. The 23-year-old has emerged as one of the Rojiblancos’ key stars, and has a golden opportunity to become their main face of attack if Antoine Griezmann finally decides to leave in the summer. When Carrasco signed the new deal, he joyfully declared himself “very happy at the club”. But it has so far been a disastrous season overall, with the frustrating form in La Liga meaning their title hopes have all but gone, and they are now just fighting to finish in the top four. Carrasco first grabbed the headlines of the British media when he netted Monaco’s third in a 3-1 win at Arsenal. He joined Atletico Madrid the following summer, and then went on to become the first Belgian to score in a Champions League final, when he came off the bench to score a 79th-minute equaliser against Real Madrid last season. Earlier this year, he registered his first professional hat-trick in a 7-1 victory over Granada.